What follows are the only remaining fragments of the Gospel of Judas, which tells the Christ story from the point of view from that most misunderstood of apostles, Judas. I wrote them for English class. 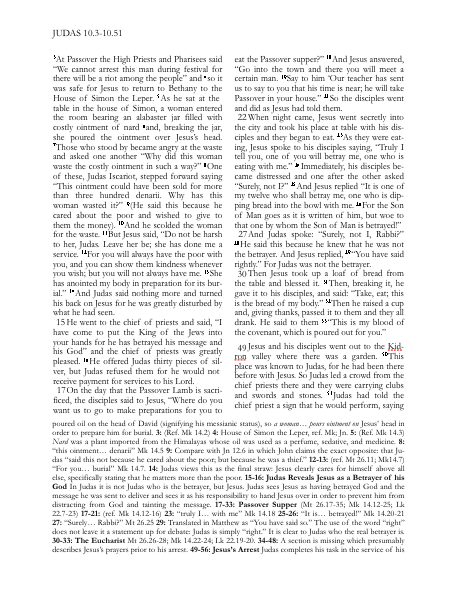 They are presented in the format of the Oxford Annotated Bible and annotated by yours truly, with notes and references to the other four gospels included. So Jesus spoke to his disciples, but they did not understand what it was that he meant. The disciples listened to Jesus and they understood what he had said. 12But Judas Iscariot, who did not understand, went to Jesus and said 13“Rabbi,b is it not enough to believe in God?” 14And Jesus replied, “No, you must believe in me also.” 15And Judas was disturbed. And Judas nodded and turned away for Jesus did not understand his own message. it. ” 6And he delayed for two days before saying to the disciples “Let us go to Judea again to visit our friend Lazarus.” 7But the disciples said to him “Why do you go to Judea? Is not Lazarus surely dead these two days?” 8And Judas said to his Lord “Why is it you waited? Now Lazarus is surely dead and buried, but yesterday you might have saved him.” 9But Jesus said only to them, “He is in a sleep from which only I can raise him.” 10And the disciples spoke among themselves for they did not know that by sleep Jesus was referring to death. Then Jesus spoke plainly so that none would think less of his deed and not believe. 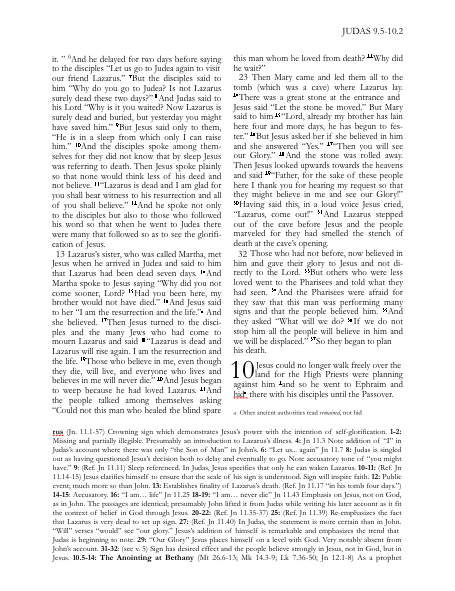 11“Lazarus is dead and I am glad for you shall bear witness to his resurrection and all of you shall believe.” 12And he spoke not only to the disciples but also to those who followed his word so that when he went to Judea there were many that followed so as to see the glorification of Jesus. Then Mary came and led them all to the tomb (which was a cave) where Lazarus lay. 24There was a great stone at the entrance and Jesus said “Let the stone be moved.” But Mary said to him 25“Lord, already my brother has lain here four and more days, he has begun to fester.” 26But Jesus asked her if she believed in him and she answered “Yes.” 27“Then you will see our Glory.” 28And the stone was rolled away. Then Jesus looked upwards towards the heavens and said 29“Father, for the sake of these people here I thank you for hearing my request so that they might believe in me and see our Glory!” 30Having said this, in a loud voice Jesus cried, “Lazarus, come out!” 31And Lazarus stepped out of the cave before Jesus and the people marveled for they had smelled the stench of death at the cave’s opening. Those who had not before, now believed in him and gave their glory to Jesus and not directly to the Lord. 33But others who were less loved went to the Pharisees and told what they had seen. 34And the Pharisees were afraid for they saw that this man was performing many signs and that the people believed him. 35And they asked “What will we do? 36If we do not stop him all the people will believe in him and we will be displaced.” 37So they began to plan his death. Jesus could no longer walk freely over the land for the High Priests were planning against him 2and so he went to Ephraim and hida there with his disciples until the Passover. 3At Passover the High Priests and Pharisees said “We cannot arrest this man during festival for there will be a riot among the people” and 4so it was safe for Jesus to return to Bethany to the House of Simon the Leper. 5As he sat at the table in the house of Simon, a woman entered the room bearing an alabaster jar filled with costly ointment of nard 6and, breaking the jar, she poured the ointment over Jesus’s head. 7Those who stood by became angry at the waste and asked one another “Why did this woman waste the costly ointment in such a way?” 8One of these, Judas Iscariot, stepped forward saying “This ointment could have been sold for more than three hundred denarii. Why has this woman wasted it?” 9(He said this because he cared about the poor and wished to give to them the money). 10And he scolded the woman for the waste. 11But Jesus said, “Do not be harsh to her, Judas. Leave her be; she has done me a service. 12For you will always have the poor with you, and you can show them kindness whenever you wish; but you will not always have me. 13She has anointed my body in preparation for its burial.” 14And Judas said nothing more and turned his back on Jesus for he was greatly disturbed by what he had seen. He went to the chief of priests and said, “I have come to put the King of the Jews into your hands for he has betrayed his message and his God” and the chief of priests was greatly pleased. 16He offered Judas thirty pieces of silver, but Judas refused them for he would not receive payment for services to his Lord. On the day that the Passover Lamb is sacrificed, the disciples said to Jesus, “Where do you want us to go to make preparations for you to eat the Passover supper?” 18And Jesus answered, “Go into the town and there you will meet a certain man. 19Say to him ‘Our teacher has sent us to say to you that his time is near; he will take Passover in your house.” 21So the disciples went and did as Jesus had told them. And Judas spoke: “Surely, not I, Rabbi?” 28He said this because he knew that he was not the betrayer. And Jesus replied, 29“You have said rightly.” For Judas was not the betrayer. God and the Word and effectively eliminates the betrayer, Jesus. 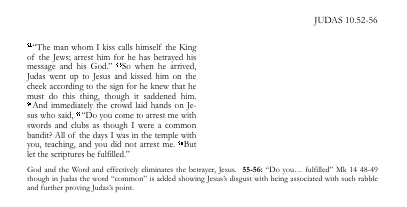 55-56: “Do you… fulfilled” Mk 14 48-49 though in Judas the word “common” is added showing Jesus’s disgust with being associated with such rabble and further proving Judas’s point.